HDR with one single shot. Using the HDR technique is the best option in many situations where lighting conditions are particularly problematic. However, getting the necessary exposures to be used in HDR composites can be hard in some specific instances, for example when you don’t have a tripod or other stable surfaces to support your camera or when you are trying to photograph moving subjects. In such instances, it has become quite common to create fake HDR images (using one exposure only) with the help of specialized software. REXiG HDR Camera recreates HDR-like effects on the iPhone: a resource in cases where lighting is not satisfactory and regular HDR is not achievable. All you need to create your HDR-like image in REXiG HDR Camera is loading a single photo to the work area. REXiG HDR Camera doesn’t need two shots like real HDR because the app simply tries to restore useful information from either dark or bright areas — or both — of your photo. For a quick enhancement of badly exposed photos, the Easy mode offers 23 presets which can be applied to images with a single tap. Presets can be found in the bottom part of the screen, and by swiping with the finger you can scroll and choose among them. For a more thorough processing and for more control, you can switch to Pro mode. Pro mode lets you adjust individual settings which affect the overall look of the image, like bright and dark intensity, saturation and contrast, and color balancing. 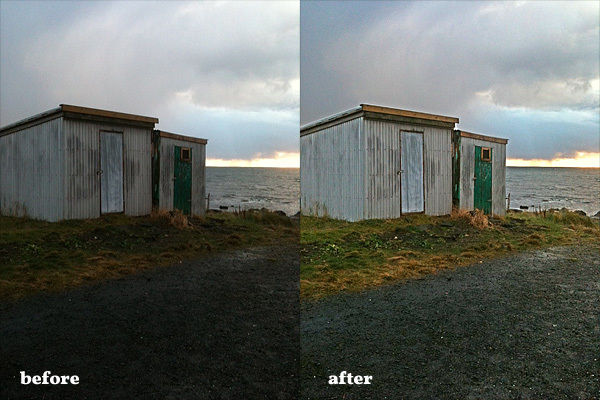 Before and after REXiG HDR Camera processing. Since recovering information from dark areas can significantly increase digital noise, REXiG HDR Camera also offers a noise reduction option. Noise reduction processing however can take some time and its effectiveness greatly varies depending on the photo you want to process. Somebody cleverly said the best HDR is the one you cannot spot. For this reason, most photographers use HDR only when they are after a well exposed and natural looking photo and they have no other means to achieve it. While REXiG HDR Camera doesn’t actually generate true HDR, it tries to imitate the looks of the heaviest and most bombastic HDR processing: most presets are extremely overdone; without proper tweaking, REXiG HDR Camera’s final results look very artificial and thus not always desirable. Notwithstanding, REXiG HDR Camera is one of the most convincing HDR replacements available on iPhone and it will definitely come in handy now and then. 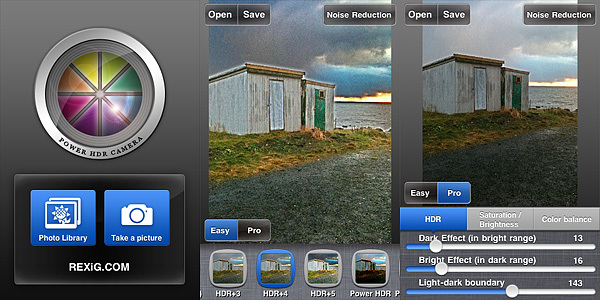 REXiG HDR Camera is free in the App Store until August 18, 2011. By the way, try take a look at Orasis as well if you’re into HDR or HDR-like single-photo adjustment. Yes, REXiG is not available right now. It’s not available in other App Stores as well, it’s not a problem with the US Store only.